← How Does Your Income And Expenditure Compare? The government continues to scapegoat precious metals.If you are coming in late,do read this previous post to catch up,Link.Today the government increased import duty on gold, silver and platinum to 10 per cent ostensibly to arrest the declining value of Indian Rupee and contain the fiscal deficit to 3.7 per cent of the GDP.The customs duty on standard gold and platinum has been raised from 8 per cent to 10 per cent and on silver from 6 per cent to 10 per cent. The results of this action in the domestic price of these metals is to be found in the picture. Gold prices might have fallen in Dollar terms,but the falling Rupee has ensured that domestic gold prices are rebounding.And the duty burdens are helping elevate prices. 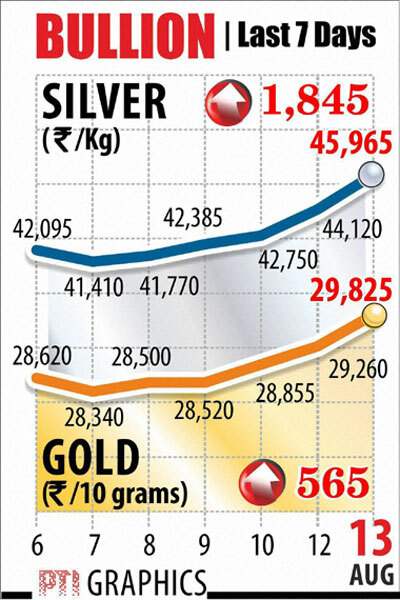 Its common sense that a relentless price rise,creates its own market.So even if the government is right in believing that gold is the cause of our misery,pushing up its price in Rupees is unlikely to lead to a fall in gold demand. Also do read what Jim Rogers says about the price of gold here:Link.If he is right in his assessment of price rise,and he has a habit of being right about trends,just not timing.Is discouraging gold purchase by Indians such a good Idea?And is the government going to be able to prevail?Or will this be as useless as the RBIs attempt to prop up the Rupee?And is it really worth incentivizing people to attempt to smuggle gold and consume smuggled gold?